The Saddest Song. Written by Harvey Derrick[cincopa AsJA7Xa1Xl6V] Used with Permission. Harvey Derrick lived and worked most of his younger years on a Texas ranch. He is a soft spoken, easy going Oklahoman who’s performance, whether in the church, on the football field or on the stage, has gained the admiration, respect, and love of friends, fans and fellow veterans. Born September 23rd in Pawhuska, Ok, he was an all-star athlete. But, he joined the U.S.Army when he graduated from Edmond High School (Edmond,OK). During his twenty-one years (ten Active Duty) of military service, he has served in special services, logistics, administration, and was a member of the United States Army Europe Honor Guard in Heidelberg Germany with the 529th MP Company and a Senior Enlisted Records Specialist with the 130th Station Hospital in Heidelberg Germany. After the army, he received a football scholarship at Missouri Southern State College, in Joplin Mo, and became the most prolific scorer in that school’s history. He still holds most of the kicking records at MSSC, including the longest field goal, 57 yards. He was voted Most Valuable Player his sophomore year, and was high in the running for the All-American Team his junior year. He was inducted in the College’s Football Hall of Fame in 1994. Hampered by a leg injury his senior year, he decided to go back to Oklahoma after receiving his bachelor’s degree and start working on his songwriting career. Harvey sang in churches all over Oklahoma as a child and was an End-Man, “Mister Bones”, in a Minstrel Show for almost two years. He won first place in his highschool talent show, his senior year, singing two of his original compositions. He has performed at state fairs, clubs, show cases, restaurants, concerts, and many charity events from coast to coast, and appeared on the Louisiana Hayride, as well as live radio and television shows. He produced and hosted a thirty minute country music show that aired on local Oklahoma City television fifteen times in 1985, which was picked up by a satellite company and aired throughout the world. Harvey was the president of the SONGWRITERS OF OKLAHOMA, with nine consecutive terms in that position, a member of the MIDWESTERN COUNTRY ENTERTAINER’S ASSN., and is the owner of Gusher Records and Furrow Music (BMI) and Planter Music (ASCAP). Harvey recorded his first record in 1983, and his first album in 1984 “Dreams On The Line” which contained his nationally acclaimed patriotic song “Butterfield’s Taps” that was the number one most requested song on KEBC Radio, Oklahoma City in 1985. He has had thirty-nine of his original songs published and recorded. He wrote the lyrics to the theme song of the OKLAHOMA COUNTRY MUSIC ASSO.. In May of 1987, his “Dreams On The Line” album was released in England by an English Record label and reached number #9 on their charts. In 1992 He recorded and released a limited edition of Cowboy Recitation Songs he co-wrote entitled “Tales Of The Western Trail” which was placed in the archives of the Dickinson Research Center of the National Cowboy and Western Heritage Museum ( Formerly the National Cowboy Hall of Fame). He also wrote a song for the “ORDER OF THE PURPLE HEART” which was accepted by that association and a song adopted by the “Procrastinators Of America. His latest project is a patriotic video of his â€œLetâ€™s Not Forget Our Veteransâ€ song which was posted on YouTube in May of 2010. To view it go to YouTube and type â€œLetâ€™s Not Forget Our Veteransâ€ in the search block. Harvey was a regular on Thursday nights and Saturday afternoons for eleven and a half years at the famous Blue Belle Saloon in Guthrie, OK and was co-host of the KOKC Jamboree, a live radio music show for 4 years at KOKC Radio in Guthrie, OK. He was the MC of the Back Porch Jamboree in Kingfisher, Ok for three years. He is a regular performer at the Cowboy Poetry Gathering held at the National Cowboy Hall of Fame and Western Heritage Center. He performed two seasons in Branson, Mo with his “Almost Together” trio. He has been an instructor at Moore Norman VoTech, teaching Creative Song Lyrics. 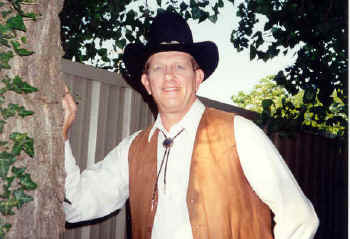 He narrates children’s cowboy books for Pelican Publishing Company out of Gretna, LA. Music has always been a part of Harvey’s life. Even though he did not learn to play a guitar until he was a junior in highschool, he spent many hours listening to his uncles and grandmother playing music and singing. Those down home, simple and wholesome roots, as well as his patriotic loyalty, have remained deep in his heart and mind and now come out in many of the lyrics he writes in songs. His single, “Letâ€™s Not Forget Our Veterans”, is an example of his touching lyrics, that chills the spine and brings tears to the eyes of every Red Blooded American who hears it. He has been working for fifteen years on an album of Patriotic songs, or stories he calls them, which include some of our country’s little known or forgotten heroes, places, and events. Though he has a voice that is said to be a mixture of such greats as Jim Reeves, Marty Robins, and Johnny Horton, with a style of his own, his ambition is to be a successful song writer so he can help young talented artists and writers, as a promoter, producer, and publisher in the music industry. One of his greatest pleasures would be to write a song that launched some young unknown artist to stardom. Harvey records, in the U.S.A., on the Gusher Record Label and makes guest appearances at private parties, opries, clubs, showcases, jubilees, on radio and television shows, and at charitable and patriotic events. This entry was posted on Thursday, November 11th, 2010 at 11:26 pm	and is filed under History of Taps. You can follow any responses to this entry through the RSS 2.0 feed. You can leave a response, or trackback from your own site. It’s curious, that sometimes the most straightforward suggestions are often the best! I will bring the above mentioned tips into approach and wait to see the outcome. Thank you for this article!